The Scotch Game (Also known as the Scotch Opening is a popular 'Open Game' opening played by white, which usually leads to tactical positions - giving plenty of options for White. The opening received its name from a correspondence match in 1824 between Edinburgh and London. Popular in the 19th century, by 1900 the Scotch had lost favor among top players because it was thought to release the central tension too early and allow Black to equalize without difficulty. 1) Schmidt Variation - Almasi, Z. vs Kryvoruchko, Y. 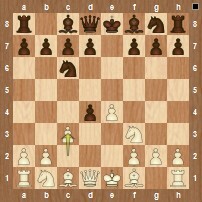 2) Scotch Gambit - Lombaers, P. vs Ahlander, B.